Utilizing the many email services that are available can boost the effectiveness of a business’s email marketing campaign. One of these services is preparing emails, which can be sent out automatically, depending on a recipient’s response. This service is effective for following up a number of actions the receiver takes; from clicking on a link you may provide in the email to products or services you offer, or for choosing to subscribe to your regular newsletters. Let’s take a look at how this particular service works, and how it can be used to transform a potential customer into an actual customer. With improved email services, such as automation, a business can really pay attention – and respond appropriately – to the different responses from different recipients. Automation involves creating an email, which will be sent out to potential customers, but at a time of your choosing. It is fairly easy to create the email, and then have the service send it for you at a specific time, or a specific date. This may be, for example, in two weeks time, at a certain time of the day. The great bonus about this is the fact that once you set the service up, it triggers the sending of the mail automatically. This is an excellent time saver for businesses. It is possible to plan a multi stage email campaign in advance, setting up three or four different emails, and leaving it to the service to send it on your behalf. Other automatic emails can be created by the business, and are triggered and sent when a potential customers investigates your mail through perhaps visiting your site. A new subscriber joins your newsletter – triggering an automatic welcome email you have previously created. A purchase is made from your business. An email is automatically sent to them thanking them for the order. A potential customer navigates to your site after responding to your initial email. This automatic response to them taking that action should welcome them to your site. A new subscriber joins your list, you can automatically send a ‘how to get started’ email, along with help and advice. These automatic responses can be either done through a single email, or a series of mails, depending on what the customer has chosen to respond to. This fosters the perception by the customer that you respond to their actions in a timely manner, and can help you to establish a good relationship, on an individual basis, with new subscribers or people who have just made their first purchase from your business. As part of this automatic service, you can offer the customer several ways to pay for their goods. As part of this process, your company is able to access specific information from customer databases. This data can be integrated into the service and used to accurately refine and tweak future emails, making sure that your specific services and products can be tailored to customers on an individual basis. For example, if your email service tells you that you get a high response rate from a certain geographical area, you can use this information in your next email campaign, allowing you to get a better ‘hit rate’ from potential customers. 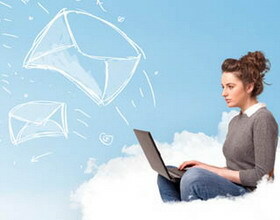 Most automatic email services give you clear results with regards to your last campaign, as part of the service. All of this information can be put to use for future email campaigns, allowing you to get a real understanding of what works and what doesn’t work so well. You can then use this information for your next campaign, enhancing opening rates and responses to your automatic marketing emails.